Human resources play a crucial role in the success of organisations and help them to achieve a sustainable competitive advantage. A number of studies have been conducted seeking to find effective ways to attract and manage talented employees (or human capital) and the part played by compensation, job design, work-life balance and growth opportunities, among others, have been examined (Barnett & Hall 2001; Johnson 2004; Olson 2003). However, nowadays, stimulated through positive psychology movements, there is a need to search beyond the human capital and to move the focus to positive Psychological Capital (PsyCap) (Luthans & Youssef 2004; Luthans, Youssef & Avolio 2007). PsyCap focuses not only on human capital ('who you are') but also on developing the 'who you want to become' or 'your best self' senses (Luthans et al. 2010). According to Luthans (2002), the positive psychology resources for PsyCap are self-efficacy, optimism, hope and resilience. To date, researchers support these four components of PsyCap (Dawkins et al. 2013; Du Plessis & Barkhuizen 2012; Görgens-Ekermans & Herbert 2013). This study is intended to contribute by establishing a valid measure of PsyCap. Such a measure has been set by Luthans (2002), as well as Luthans et al. (2007). In contrast with the initial developmental work and studies on the PCQ (both locally and internationally) - which was based on relatively homogeneous samples - this study made use of a representative sample of the South African work force, with the sample including employees in both the private and public sectors. Although attention has been given to the importance of positivity in the workplace, it has only recently been proposed as a new way in which to focus on organisational behaviour (Cameron, Dutton & Quinn 2003; Luthans & Youssef 2007). Motivated by the new positive psychological movement, positive organisational behaviour can be defined as the application and study of positively-oriented human resource psychological capacities and strengths that can be developed, managed and measured for improved performance in the workplace (Luthans 2002). This newly-emerging, positive organisational behaviour recognises early history such as Herzberg's (1966) two-factor theory of job satisfaction, Maslow's (1954) hierarchy of needs and McGregor's (1960) Theories X and Y, as well as other contemporary research and theories which are positively-oriented. These include, among others, organisational commitment, job satisfaction, positive affectivity, organisational citizenship, core self-evaluations, organisational justice, intrinsic motivation, self-determination and humour (Luthans, Avolio et al. 2007). The psychological resources which meet the criteria for positive organisational behaviour best are hope, self-efficacy, optimism and resilience (Luthans 2002; Luthans et al. 2007; Luthans, Avey & Patera 2008). Researchers such as Luthans and Youssef (2004, 2007) and Luthans et al. (2007) developed the term 'Psychological Capital'. 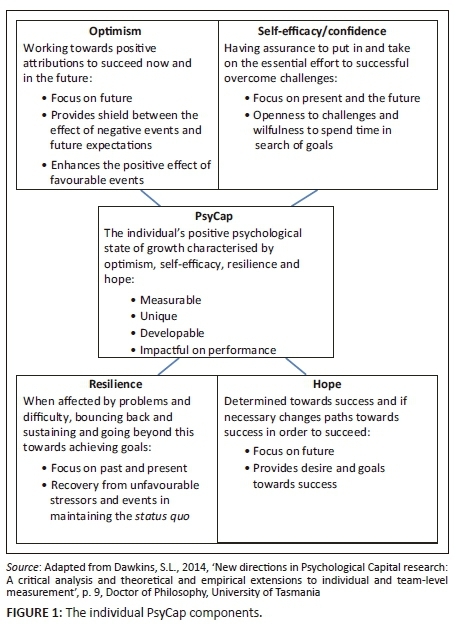 According to these authors, Psychological Capital (or PsyCap) is a term used for positive organisational behaviour and can be defined as an individual's positive psychological state of development which is characterised by optimism (making positive attributions), self-efficacy (having confidence), resilience (to attaining success) and hope (redirecting paths to goals) (Luthans et al. 2007). According to Dawkins (2014), PsyCap can be defined as an individual's state of psychological development comprising resources such as optimism, self-efficacy, resilience and hope. According to Sapyaprapa, Tuicomepee and Watakakosol (2013), PsyCap has been developed to attain a supporting unity between the organisation and its employees and to put the organisation at a competitive advantage. Self-efficacy within the PsyCap context refers to an individual's confidence with regard to his/her ability to activate cognitive resources, establish a course of action and to find the motivation needed to successfully implement certain tasks in a given context (Stajkovic & Luthans 1998). In other words, when an individual's self-efficacy is high, he or she is more willing and able to face challenges and to extend his or her effort and motivation to successfully achieve goals (Dawkins 2014). According to Luthans et al. (2007), an individual with high self-efficacy cherishes five characteristics, namely: (1) setting high goals; (2) embracing challenges and then flourishing; (3) being self-motivated; (4) putting in effort to accomplish goals; and (5) persevering to overcome obstacles. The first step of the factor analysis was to evaluate the appropriateness of the sample size. The item to respondent ratio is ±1:73, which is acceptable according to Meyers, Gamst and Guarino (2013) and Tabachnick and Fidell (2007). Second, the inter-correlations between items were inspected using Bartlett's test of sphericity (Hair et al. 2010). With this test, the statistic generated should be significant (p < 0.05) for an EFA to be considered an appropriate technique (Hair et al. 2010). Finally, the Kaiser-Meyer-Olkin (KMO) measure was used to quantify whether the items correlated sufficiently in order to determine whether a factor analysis could be performed. The minimum level set for this statistic is 0.60 (Tabachnick & Fidell 2007). The validity of the PCQ was also established, according to the various definitions and types of validity provided. Cohen, Swerdlik and Sturman (2013) are of the opinion that validity is, in short, an estimation of how well a test measures what it is intended to measure. For the purposes of this study, the main focus will be on construct validity, which is an estimate of how the construct (which is intended to be measured) behaves in relation to other constructs and related measures (DeVellis 2003). Thus, 'to evaluate the construct validity of a test, we must amass a variety of evidence from numerous sources' (Gregory 2011:119). An additional rigorous test of construct validity is the so-called factorial validity, which is based on the results of factor analysis, with the primary purpose of defining the underlying structure among the variables included in the analysis (Hair et al. 2010). When the instrument displays the expected structure internally, this could be indicative of construct validity (Moerdyk 2009) and, specifically, factorial validity. The strategy adopted for model cross-validation was to use a combination of the Likelihood Ratio Test (differences in χ2 or chi-square difference between the models), the difference in Tucker-Lewis Index (TLI) which should be less than or equal to 0.05 and lastly the comparison of the expected cross-validation index (ECVI) point estimates. If the model cross-validates well, there should be little, if any, difference between the chi-squares and ECVI point estimates for the calibration and validation samples. Information on convergent validity was created by calculating the correlation between the PCQ (and its components/factors) and several other measures. 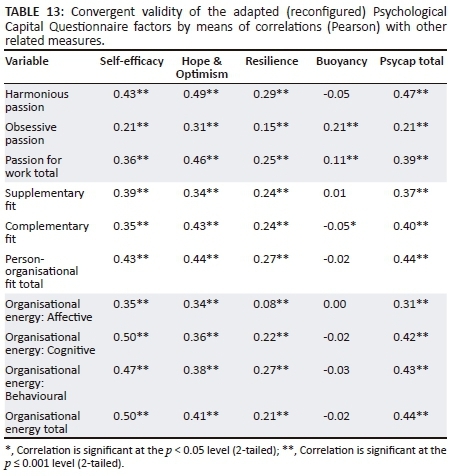 It was hypothesised, supported by previous studies and literature, that Psychological Capital would correlate significantly with (developers indicated, with the Cronbach alpha coefficients (α) as determined in this overall study): Passion for work, including the sub-factors Harmonious passion (α = 0.87) and Obsessive passion (α = 0.89) (Vallerand & Houlfort 2003); Person-organisational fit, including Supplementary fit or Indirect fit (organisation fit as values congruence) (α = 0.91) and Complementary fit or Direct fit (needs-supplies fit and demand) (α = 0.87) (Cable & DeRue 2002; Grobler 2016); and lastly, Organisational energy, which comprises an affective (α = 0.96), behavioural (α = 0.84) and cognitive (α = 0.86) dimension (Cole, Bruch & Vogel 2012). A correlation of 0.4 is an indication of convergence with 0.50 and higher - a clear sign of convergence (Cohen et al. 2013; Gregory 2011) - and is often referred to as the heterotrait-mono method coefficient. This entails correlations between measures of different traits that are furnished by the same method of measurement, with the opposite being heterotrait-hetero method coefficients (correlations between measures of different traits that are obtained using different measurement methods). Ethical clearance was obtained from the Unisa Graduate School of Business Leadership's research ethical committee before the field work was conducted. The ethical clearance application included all the standard items such as: consent of participants (with an explanation of the study); permission to conduct the study in the respective organisations; inclusion criteria and the methodology to be used (pencil and paper). The research ethics clearance certificate is dated 16 February 2016, with reference number 2016_SBL_002_CA. Due to the relatively poor psychometric properties reported in Table 3, and the relatively poor fit statistics of the original factor structure as well as the structure determined by Du Plessis and Barkhuizen (2012) within the South African context, it was decided to conduct an EFA. In order to determine the suitability and appropriateness of a factor analysis on the existing instrument with 24 items, Bartlett's test of sphericity and the KMO were performed. The Bartlett's test of sphericity c2(276) = 19 157.12, p < 0.001, indicated that correlations between the items were sufficiently large for an EFA. The KMO value was 0.94, which is higher than the critical value of 0.60; in other words, both these criteria meet the criteria to perform an EFA. The K1 rule was used in conjunction with the scree plot to determine the number of factors. The Kaiser's criterion focusing on eigenvalues >1 was performed and is reported in Table 5. 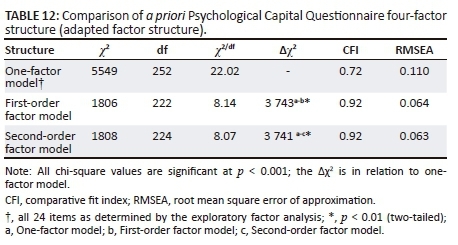 Five factors reported eigenvalues >1, with the first factor explaining 36.12% of the variance in the construct Psychological Capital, followed by 7.77%, 7.08%, 5.58% and 4.49% of factors two to five, respectively. The total variance explained by the five factors is 61.03%. 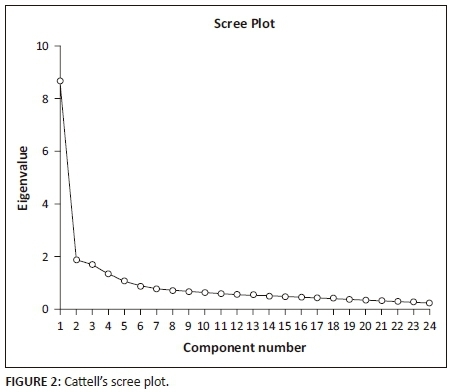 In order to determine the number of factors to retain in the factor structure, the Cattell's scree test was performed and the results are reported in Figure 2. F1: Self-efficacy, which is a composite dimension of the original instrument by Luthans et al. (2007), has seven items, with six items from the original self-efficacy factor (PsC1-6) and one item (PsC7) from the original hope factor. F2: Hope & Optimism has eight items and is also a composite factor (in terms of the original factor structure), with four items each (eight in total) from the original hope factor (PsC8,10,11,12) and the original optimism factor (PsC19,21,22,24). F3: Resilience (total five items) also consists of items from two of the original factors of Luthans et al. (2007), with four from the original resilience factor (PsC14-17) and one from the hope factor (PsC7). The last factor is the only factor not in the Luthans et al. (2007) factor structure, called for the purpose of this study, Buoyancy. The obvious factor name would have been Pessimism (as also alluded to by Dawkins et al. 2013), but due to the fact that PsyCap falls within the domain of positive organisational behaviour, it was decided to name it positively. It consists of one item from the original resilience factor (PsC13) and two from the original optimism factor (PsC20,23). The commonalities (h2) of the items are relatively high (> 0.30). Assessment of the best-fitting model within the three models was conducted through the application of CFA. The one-factor model (all 24 items) was identified as the worst-fitting model (CFI = 0.72, RMSEA = 0.110). By analysing the chi-square test values, it further appears that the first-order factor model is slightly better than the second-order factor model. The difference in chi-square between the second-order factor and first-order factor models is 2 (i.e., 3743-3741), which is distributed as chi-square with 222-224 = 2 degrees of freedom. The best-fitting model is thus the first-order model (modelb) in which all 24 items loaded directly on their respective factors (i.e. Self-efficacy, Hope & Optimism, Resilience and Buoyancy). All the multiple regression results, as reported in Table 14, are statistically significant (p ≤ 0.001). The beta (ß) values reported indicate the uniqueness of the four factors in terms of their contribution in explaining the variance in the related constructs. This is an indication of discriminant validity, but, consistent with the convergent validity, Buoyancy's contribution, although unique, is relatively limited with only two beta (ß) values that are statistically significant (p < 0.05), on Passion for work: Obsessive passion and Passion for work: Total. The purpose of this study was not to determine invariance between demographic groups, but it was deemed necessary to conduct an elementary cross-validation assessment of the preferred, second-order factor structure as reported in Table 15. The sample was split into gender groups, with 568 men (58%) and 410 women (42%). The results reported for the two sample groups were χ2/df (162) = 4.65, CFI = 0.94, TLI = 0.92, RMSEA = 0.063 and χ2/df (162) = 5.04, CFI = 0.92, TLI = 0.89, RMSEA = 0.070 for the male and female group respectively. The degree of invariance in terms of the Likelihood Ratio Test is 0.39 (5.04 - 4.65). A further indicator of invariance is the difference between the TLI values (0.92 - 0.89 = 0.03), which is lower that the norm of 0.05. The ECVI values reported by the male and female sample groups are 1.01 and 1.22, respectively (difference = 0.21), which is marginal. The results of this assessment in terms of the comparisons between the two sample groups lend support to the accuracy of the cross-validation results. Construct validity - also referred to as factorial validity and based on the results of both an EFA and a CFA - was conducted with the primary purpose of defining the underlying structure among the 24 items of the PCQ. Based on these relatively poor psychometric results, it was decided to conduct an EFA, a decision supported by the results of the Bartlett's test of sphericity and the KMO. The EFA with Promax rotation, as well as the Monte Carlo parallel analysis simulation, yielded a four-factor solution, explaining close to 57% of the variance. The four factors extracted by means of the EFA reported reasonable psychometric properties, with Cronbach alpha coefficients of 0.90 and 0.60 (the lowest for F4 which is a factor with only three items, all of which are negatively-worded). The factors were named in accordance with their original theoretical and PCQ names, with the Self-efficacy (seven items - six items from the original self-efficacy factor and one item from the original hope factor), Hope & Optimism (eight items - four items from the original hope factor and four from the original optimism factor), Resilience (five items - four from the original resilience factor and one from the hope factor) and lastly, Buoyancy (three items, a new factor with all items phrased negatively, with one item from the original resilience factor and two from the original optimism factor). In order to satisfy the substantive element of construct validity (although not the aim of this study), and with full acceptance of the Luthans et al. (2007) conceptualisation of PsyCap, one has to determine possible causes for this reconfiguration. The Self-efficacy factor stayed very similar, with the addition of PsC7 'If I should find myself in a jam at work, I could think of many ways to get out of it'. This item includes an element of positive belief in the individual's abilities to execute a specific task successfully which, according to Stajkovic and Luthans (1998), is an attribute of self-efficacy. The structural positioning of this original Hope item with Self-efficacy can therefore be justified substantively, without changing the original definition of Self-efficacy by Luthans et al. (2007), Luthans and Youssef (2004) and Dawkins (2014), as 'having assurance to put in and take on the essential effort to successful overcome challenges, and to obtain specific outcomes'. The third factor, Resilience, is very closely comparable to the original factor with the same name, with only the addition of PsC9 from the original Hope factor. The item reads 'There are lots of ways around any problem' and could be related to the adapted description by Dawkins (2014:9) that what Resilience entails is 'bouncing back when affected by problems and difficulty and sustaining and going beyond this towards achieving goals'. This item fits into this definition as it is about recovery from unfavourable stressors and events in maintaining the status quo, providing practical substantiation as to why it is added to the original Resilience factor. All the elements of the original conceptualisation of PsyCap have been included so far, with the only deviation being that of the composite factor Hope & Optimism. The EFA has, however, yielded a four-factor model with the last factor comprising three items (all negatively phrased) with PsC13 'When I have a setback at work, I have trouble recovering from it, moving on' from the original Resilience factor and two from the original Optimism factor, namely PsC20 'If something can go wrong for me work-wise, it will' and PsC23 'In this job, things never work out the way I want them to'. Due to the fact that PsyCap is considered to be a positive organisational behaviour construct, and that one of the criteria for it to be classified as such is that it should have a positive impact on work-related behaviour (according to Luthans 2002), it was decided to name it positively, hence Buoyancy. Based on the content of the three items, it can be defined as 'a positive work attitude by anticipating that things would go according to plan, with confidence in coping with setbacks occur and when things don't go according to plan'. The value of this study lies in the fact that the original conceptualisation of PsyCap - consisting of Hope, Optimism, Resilience and Self-efficacy elements - has been confirmed. The measurement of PsyCap (by means of the PCQ) has been adapted through a reconfiguration of items and factors, ending up with a three-factor solution (that includes all four PsyCap elements), and the elimination of three problematic items. Based on the results obtained, it seems that the PCQ is a suitable (valid and reliable) instrument for measuring PsyCap. This study could thus serve as a reference for the accurate measurement of PsyCap. This research does have certain limitations, however, mainly in terms of the methodology. The PCQ is based on self-reporting - a method which may lead to method bias, and this may still be a reality, even with the assurance provided to participants during the briefing regarding anonymity as well as confidentiality. Social desirability and subsequent response bias will always remain a concern and a limitation in studies such as this one, while self-reporting may be seen as a one-sided report from the respondents' side. An additional possible limitation is that the wording of the initial scale was used 'as is', without adapting it to the South African (multilingual) context. PsyCap profiling could also be considered in future research to determine how different organisational cultures, climates and leadership styles impact on the employees' PsyCap.